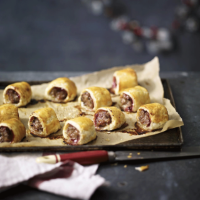 The traditional Christmas flavours of chestnut and cranberry are combined perfectly in these sausage rolls. 1. Preheat the oven to 190ºC, gas mark 5. Using a sharp knife, slice the sausage skins and squeeze out the sausagemeat into a bowl. Stir in the chestnuts and sage. 2. Unroll the pastry on a lightly floured work surface and cut it in half lengthways. Spoon the cranberry sauce down the centre of each half. Divide the sausagemeat mixture in half and roll each batch into a long sausage the same length as the pastry. Lay each half on top of the cranberry sauce. 3. Brush the edges of the pastry with a little beaten egg. Fold the pastry over the sausage, then roll it over so that the join is underneath. Cut each piece into 8 sausage rolls. Line 2 baking sheets with baking parchment and transfer the sausage rolls onto them, keeping the pastry join at the bottom. Brush a little more egg over the top and bake for 20–25 minutes, until the sausagemeat is cooked through. Transfer to a wire rack to cool before serving. Cook’s tipFor a more savoury flavour, try swapping the cranberry sauce for wholegrain mustard, or make a selection of both flavours.